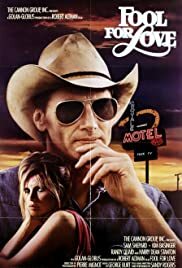 Adapted from Sam Shepard's play, this movie retains many play-like elements such as a relatively fixed setting (a roadside 50's motel in the Southwest) and extensive, intriguing dialogues. A woman "May" is hounded by a man "Eddie" (played by Sam Shepard). She tries to hide from him in the out-of-the-way motel, but he finds her. The film explores the history of their relationship, mainly from their childhoods, that has led them to this point. It's very easy to feel sympathy for the characters and to understand that their dysfunctional present relationship is a result of past events out of their control. We mainly watch them fight, make up, fight, make up and so on. One image that stands out in my mind, is of Eddie hauling May over his shoulder kicking and screaming, taking her somewhere she doesn't want to go. The soundtrack is also perfect soulful country with vocals by a lesser known artist "Sandy Rogers". She has this country doll voice that almost yodels at some points in the album! This is the kind of movie that will stay lodged in some part of your brain/soul. In other words, go see it!